Africa, a continent that boasts almost 600 million hectares of uncultivated arable land – roughly 60 percent of the global total – has an annual food import bill of $35 billion, which is estimated to rise to $110 billion by 2025, according to the Food and Agriculture Organization (FAO). The continent is also home to the vast majority of the world’s hungry people, with 12.9 percent of its population being undernourished. This is in a region where almost 70 per cent of the population is involved in agriculture. Nonetheless, the situation can be salvaged through an agriculture-led transformation driven by sound policies and effective regulatory frameworks. The timely supply of the right type of seeds and fertilisers in the right quantity and quality can rejuvenate agricultural production. In countries such as Ethiopia, a steady increase in maize harvests has been recorded following the implementation of regulation allowing farmers a steady access to modern farm inputs and extension services. The country averages three metric tons per hectare, the second highest in Sub-Saharan Africa, after South Africa, according to a study, led by Dr. Tsedeke Abate of Canada’s Simon Fraser University. Yield gains for Ethiopia grew at an annual rate of 68 kg per hectare between 1990 and 2013, a pace greater than that of Mexico, China and India, some of the world’s biggest maize producers. Similarly, the maize area covered by improved varieties in Ethiopia grew from 14 per cent in 2004 to 40 per cent in 2013, as the application rate of mineral fertilisers grew from 16 kg per hectare to 34 kg per hectare during the same period. Equally important is the improved extension worker to farmer ratio, which currently stands at 1:476, compared to 1:1000 for Kenya, 1:1603 for Malawi and 1:2500 for Tanzania. All these achievements by Ethiopia have been made through a supportive environment, leading to the establishment of national seed and fertiliser policies, regulations and standards. Other territories, according to Boaz Keizire, AGRA’s Head of the Policy and Advocacy, can gain similar traction through the deployment of strengthened country-specific policies to bolster input circulation and market access systems. Tanzania is already on the way to attaining stability in fertiliser distribution mechanisms after the implementation of policies inviting private sector participation. Until the mid-1990s, the fertiliser sector in the East African country was primarily controlled by the public sector. Importation and distribution of fertiliser was done by the state-owned Tanzania Fertiliser Company (TFC). With significant liberalisation in the early 2000s, the functions of TFC have now been limited to trading and distribution within the country, with significant investments recorded by private sector players in the importation of the product into the country. Tanzania’s National Public Private Partnership Policy (2009) acknowledges the role of the private sector in bringing about the desired socio-economic development through investments in farm inputs distribution to smallholder farmers. 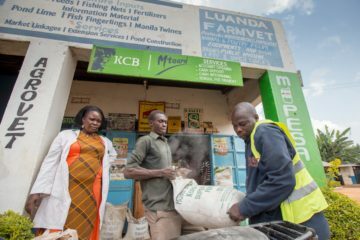 Likewise, policy changes have strengthened fertiliser distribution plans in Ghana, Kenya, Mali, Mozambique, Rwanda and Uganda through the entrenchment of private sector players in market chains. In Rwanda, particularly, the positive policy environment, which favours development through agriculture, has been a major driver for the robust development of fertiliser and input distribution systems. Correspondingly, Africa could go one better by increasing its capacity to locally produce seeds, fertiliser and other farm inputs. It is important to note than nearly all countries in the continent have seed production capacities that can meet the demand of local markets. Yet it is only now that countries such as Rwanda are setting up rules and regulations to bar the import of some improved seed varieties in favor of domestic production. The country now plans to enhance its local production of hybrid maize, wheat and soybean, saving the $6.4 million that was previously committed to imports. In the same token, the prices of fertilisers can be tamed through local production as some of the countries in the continent can produce the required raw materials. Fertiliser production enterprises are found in Mali, Kenya and Tanzania, with large quantities of urea being produced in Nigeria. Imported raw materials and intermediates can be sourced from countries such as Burkina Faso, Malawi and Mozambique. Through cross-border cooperation policies and frameworks, these countries can produce the quantities of fertilisers and other inputs needed to support the growth of the continent’s agricultural yield. For these purposes, the contribution of expert knowledge remains invaluable as is the need for public participation. In the end, investments in the sector need to be supported by evidence-based research and should conform to the hierarchy of demands by the majority small holder farmers, who account for 70 percent of Africa’s food supply. Abate, T., Shiferaw, B., Menkir, A., Wegary, D., Kebede, Y., Tesfaye, K., Kassie, M., Bogale, G., Tadesse, B. and Keno, T. (2018). Factors that transformed maize productivity in Ethiopia.